Creating an effective and safe commercial kitchen lighting design that limits both upfront and long-term costs is not a simple problem. If your lighting system is properly designed, it will provide an enhanced environment for your staff while reducing your long-term energy usage. But along with these considerations, emergency lighting equipment and electrical supply systems all have to fully meet regulatory requirements. Qualified and highly experienced designers, engineers and trades persons have to be involved to guarantee that you get the best possible result when you install new lighting in your commercial kitchen. Otherwise, you may ultimately find yourself forced to redo the entire kitchen lighting design because it is simply not working for you. One thing you definitely want to think about when installing new commercial kitchen lighting is the relationship between artificial lights and natural lighting. While it is true that artificial lights will be the primary source of light in a kitchen, natural lighting can also play an important part. If possible, kitchen window should be at least 10% of the total wall area in the kitchen. They should look out an open space or the sky. Even though skylights and windows can offer an improved working environment for staff by allowing natural light into the workspace, if poorly positioned they can result in a good deal of glare. It’s important for the lighting designer to carefully weigh the positions of the windows and how the artificial and natural light will interact and impact the staff while they are doing their work. While UK regulations do not require specific luminance levels in a commercial kitchen, as a general rule approximately 500 lux is what you will find in most restaurant kitchens. For specific tasks, the level can be different. For instance, cake decorating and dessert presentations – which have a lot of detail work – might require as much as 800 lux. On the other hand, washing areas might require less. Also keep in mind you might want to start out with lighting that is 100 lux higher than you actually need, since light loss can occur over time. It’s essential any light fittings installed in a commercial kitchen avoid contributing to food contamination. In part, this means that they should be designed to be quickly and easily cleaned once they are installed. Usually, it’s best that light fittings are either surface mounted or recessed on ceilings. Any suspended light fittings will have a tendency to collect dust and can – as a result – represent a potential source for food contamination. Another important consideration when it comes to light fittings is the diffuser. A well-designed diffuser will not only help distribute the light uniformly, it will also be designed in a way that will contain any fragments resulting from the globe being shattered – which is something that will inevitably happen when you have a lot of lights in a busy work area. Emergency lighting is necessary in any restaurant and commercial kitchen to ensure that staff and patrons can quickly and safely evacuate in the event of an emergency. Obviously, emergency lighting should turn itself on automatically if a power failure occurs. This in turn means that it will have to have its own separate power supply. Emergency lighting must be provided for any areas where there are potential hazards, which includes changes in floor level or surface type. This lighting also needs to be placed near all exits and at regularly spaced out intervals to ensure that adequate lighting levels are maintained so the facility can be safely evacuated. Another important consideration when choosing a positioning emergency lights is that they should not result in so much glare that they actually interfere with individuals trying to escape from the premises. And once emergency lighting is installed, it has to be regularly maintained according to a schedule, with all maintenance checks being confirmed and recorded. Failure to properly maintain emergency lighting can represent a major liability issue for the business owner. Aside from these specific steps, you should also form an energy audit. This will allow you to develop a full energy reduction strategy, which can inform your design and purchasing decisions when you are installing new commercial lighting in your kitchen. All successful business owners recognize that every decision they make has an impact on whether their business operation will succeed or fail. When applying this concept to lighting for commercial kitchens, it’s clear that – even though the effect of lighting decisions can be an enormous for the ultimate success of the business – final decisions are often made about the lighting design without giving due consideration to the various options. This makes it difficult to get the best possible result. In fact, the vast majority of traditional restaurants will simply install standard fluorescent lighting without ever giving much thought to the matter. But when looking at lighting for commercial kitchen, there are 5 specific options that all business owners should weigh when making their lighting decisions. As mentioned above, it is almost inevitable that a light in a commercial kitchen will at some point shatter, which could send shards all over the place. Even if no one in the kitchen is injured, the process of dealing with this camp virtually shut down your kitchen until you have guaranteed that every single bit of glass has been dealt with. You definitely cannot serve people food that could potentially contain shards of glass. There are several reasons why commercial kitchen should have shatterproof bulbs. The primary reason is that the extremely high temperatures found in many kitchen areas – such as near ovens and stoves – can often result in bulbs shattering. This is especially the case if the bulbs are of inferior quality. The danger this represents to the customers eating the food has already been mentioned. Another reason for installing shatterproof bulbs is that employees can also be injured when shattered glass either cuts them or gets into their eye. But any of these painful or dangerous circumstances can be easily avoided by simply installing shatterproof bulbs. There are several different types of shatterproof bulbs to fit your specific needs and fixtures, with many being no more expensive than standard bulbs. Another terrific tip for any commercial kitchen lighting is to light areas based on colour temperature. Since cooler temperatures help aid with focus and concentration, you’ll want to have this wherever cooking or cutting tasks are being carried out. But for the kitchens plating area, it would be better to use warm temperature lights. The reason you want to use warm temperature lights in these particular areas is that these lights are more visually appealing and can aid the employee when he or she is plating the food. They will more easily be able to arrange the food in an aesthetically pleasing way for the customer. Another good trick is to try to use the same colour temperature in the plating area that the customer experiences when receiving the food. This will help guarantee that it looks the same to the customer and to the person putting it together. In a commercial kitchen, cleanliness is more than a virtue: it is an absolute necessity. This is why recessed lighting is used in so many restaurant kitchens. Any fixture positioned directly inside the ceiling is going to be far more easily cleaned than fixtures that are hanging down accumulating residue, food particles and dust. In addition to reducing the danger of contamination, this will also reduce the amount of time that staff has to spend cleaning these fixtures. While it is certainly important to have general lighting in a commercial kitchen – usually in the form of recessed lights, lighting for specific tasks is also very important. Task lights literally focuses on smaller tasks workers perform in a commercial kitchen. These tasks need either more light or light that is focused on one spot. For example, when a staff member is chopping away on a cutting board it’s best to have a single focused light to ensure precision and safety. Other stations in the kitchen might require something very different, which means tailoring the lighting design so that each job your employees perform is correctly lit. A kitchen is already a very hot working environment, so you don’t want to add more heat than you need to. And of course all that extra heat production and heat loss means you’re also wasting energy and money. Traditional fixtures will produce at least some heat – and sometimes a great deal – when converting electricity into light. However, these days there are much more efficient technologies – such as LED lights – which produce little in the way of heat while still generating plenty of light for the working area. The electricity used to light a restaurant represents – on average – 13% of its energy usage. This makes minimizing the ongoing expense of operating lights in a commercial kitchen and important factor in reducing the overall operating costs for the business. Using energy-efficient LED light fixtures and bulbs will not only protect the environment and save energy, it will also improve the bottom line. 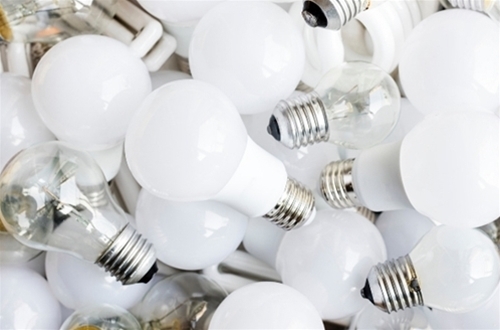 Traditional light bulbs consume 75% more energy than more efficient modern bulbs. Plus, they waste much of that excess energy as radiant heat. Either initially installing or upgrading your commercial kitchens lighting to more efficient light bulbs and fixtures that have controls allowing you to reduce your energy usage only makes sense. Fortunately, there are a multitude of LED-based lighting products to choose from. This includes downlights, accent lights, recessed lights and much more. This variety allows businesses to get exactly the right light for the right purpose. What Are the Benefits of Using LED Lights Instead of Traditional Lights? LED Lights – The Right Fit for Commercial Kitchens? Considering the various attributes of LED lights, it’s clear that they offer businesses operating commercial kitchens a range of useful advantages over more traditional lights. One advantage offered by LED lights is that they are remarkably bright, which can help to compensate if natural light is low because of adverse weather conditions. This kind of bright, reliable light is extremely important for chefs trying to prepare sophisticated, visually appealing food for customers. Then there’s the issue of safety. When your staff is using sharp knives and other relatively dangerous cooking equipment, it greatly enhances safety if they are able to see every detail of what they are doing. Even beyond practical, hands-on concerns like safety and quality of food production, this brightness offers another significant benefit. Lowlight conditions in a workplace can be damaging to the morale and safety of a kitchen staff. A well-lit work space is uplifting a, encouraging workers to see their work environment as positive and motivating them to do their very best. The fact that these bulbs last much longer than more traditional bulbs also improves the efficiency of a commercial kitchen. Instead of constantly having to swap out burnt out bulbs with new ones every few months, you can depend on LED lights to last literally for a decade or more. No more interrupting dinner preparations just to change out an awkwardly positioned bulb. The preparation of high-quality foods in a commercial kitchen requires a tremendous focus and attention to detail. In order to guarantee a consistently satisfying dining experience for customers, it is vital that every aspect of the kitchens operation be as efficient and reliable as possible. This includes every frame from the staff to the cooking utensils to – yes – the light fixtures. Efficient, bright and long-lasting lights can make a significant contribution to the efficiency and operation of virtually any commercial kitchen. As other commercial kitchen operations still use more traditional lighting fixtures and bulbs, including fluorescent lights, many more businesses are turning to LED lights to provide the lighting needs for their commercial kitchens. As laid out above, LED lights offer tremendous benefits compared with other available lighting technologies.